I was sore over the weekend from Friday’s WOD (the 2 minute drills). When I get the ‘creeping crude‘ – my word for how I feel when my immunity drops, or when the body is letting me know that Im getting ready to get sick – I feel it in my arms, shoulders and neck. When this happens I do all the things Ive learned over the years to keep this body healthy, like stay warm, eat warm food, get more sleep, and go slow. So here I was feeling the creeping crude on Saturday when I went in to get dunked. Instead of resting, I had a 2-hour trip to the airport, then the dog dug out. So aside from the long, traffic filled drive, I had to fill a hole and hammer wooden stakes into the ground, then chase the dog down! Woke up Sunday feeling like I was in full blown sick mode, except, I wasnt sick .. I was just sore in all the places I feel when my immunity drops. In other words, I felt like crap (hence: the ‘creeping crude’). And so I slept lots, ate warm food, and even though its 95 degrees outside, wore a pair of socks and a long sleeve t-shirt round the house. This morning at CrossFit I told Keefa that I felt like “pond water”; which I explained as a military expression meaning “slow, sluggish and stinky”. So I didnt do the personal warm-up Ive been slowly developing since I started CF; instead I did about 10 HSPU and got ready for the group exercise. Then right into the .. Being no where near 45# (pounds), Keefa suggested the 22# bar. Weightlifting is a challenge to me, simply because its not something I do all the time. When I broke my foot in the Army I couldnt run, so went to the gym and worked out. There I met a WO3 who taught me how to lift weights – and I bulked up enough to get taped every time there was a weigh-in – but what I did then is different from what I am doing now. So using the bicameral mind – one part going over the Hand Squat Clean tech, the other pondering weightlifting and Yoga – I arrived at an idea. Yoga, which I know so well, is natural body movement. Likewise, the weightlifting we do in Yoga is all body weight exercise. This means, in Yoga terms, that I have the strength to ‘bench press’ / lift my body weight (126 lbs). Now, there are several ways todo this in Yoga, such as in Crow and Peacock, Handstand and Scorpion, Floating Lotus and Eight-Limbed Pose. Clearly, none involve an object (like the weight bar), and none involve lifting that weight over my head. Now .. I suppose it could be argued that Handstand and Scorpion are ‘over the head’ lifts, yet .. they simply dont feel the same. Or, at least, I havent gotten solid enough with the bar to feel anything more subtle. So .. as every day brings .. its just a learning curve. 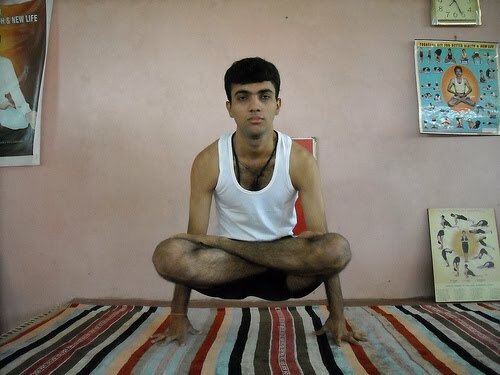 I really took my time with the HSC, because technique (as in Yoga) is everything. Truly, the very foundation upon which any ‘house’ is built. So I took my time and did my best to remember the steps, to assist the body’s muscle memory. When it was finished, I had done about 107, because on the last 10 (in almost everything I do in CF now), I tell myself, ‘Last 10 .. do it right!’ This means, if I do a step wrong – like not dip, or not shrug, or dont lift the elbows – I dont count it. Lol .. not for the entire 100 mind you .. just the last 10! So here I am considering going to CF tomorrow .. making it my first ‘double day’ .. but also thinking how I will no doubt be sore tomorrow with that creeping crude feeling (upper body), but this time with a heavy dose of 100 Squats! Its the beginning of Week Five, its Monday, so its a good opportunity to start the week with a solid 5 day CF experience. Lol .. then see if Im able to lift my arms to type this blog!